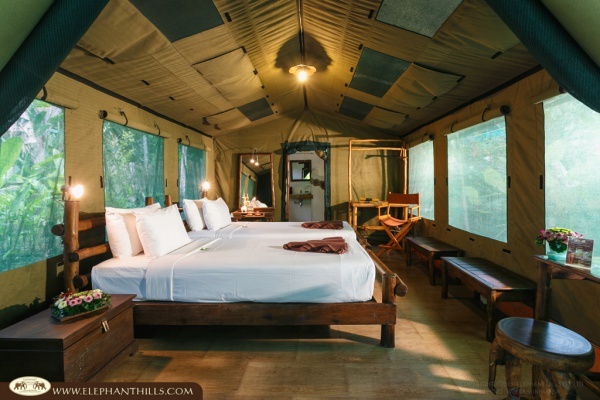 Elephant Hills is Thailand’s first luxury tented jungle camp combining the camp idea of African national parks with the Thai tropical forest environment. 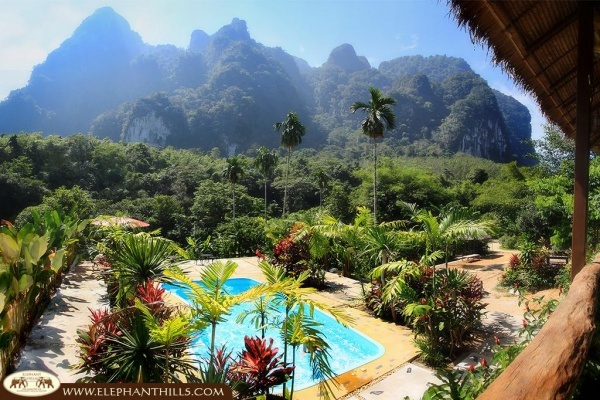 The Elephant Hills Camp comprises of 30 luxurious tailor-made tents and is located in the largest area of rainforest in Southern Thailand, the Khao Sok National Park. Each tent features comfortable solid beds, fan, kettle, and a luxurious bathroom with toilet and hot & cold shower. The tents provide ample space and are well protected against mosquitoes and other possible intruders. The furniture is handmade by the camp's own craftsmen using natural materials and provides all the comfort a guest would normally find in a hotel room. At the center of the camp is the semi-open air main camp housing the restaurant. This serves as the place to meet other guests. The forest is filled with animals and plants, some of them can only be found in this environment. 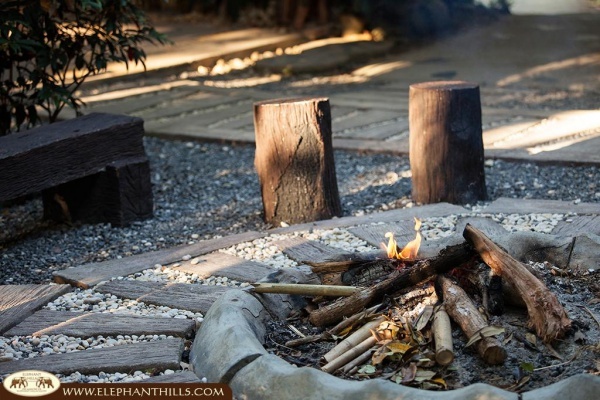 A night at Elephant Hills is a unique experience; the temperatures drop, campfires create a romantic and warm atmosphere in which to share travel tales and the rainforest and its inhabitants form an exciting concert that accompanies visitors through the night. In the morning guests awake to the different noises of the forest; the jungle wakes up whilst the hills surrounding the camp are still covered in mist. 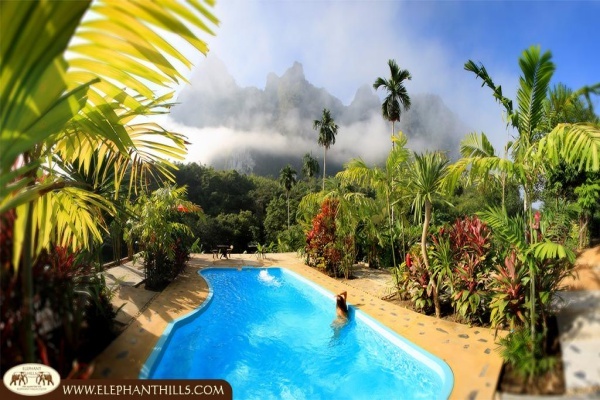 Once the mist disappears, the lush greenery of the tropical rainforest stunningly lights the day and it is possible to take in the magnificent views of the surrounding rainforest covered mountains. 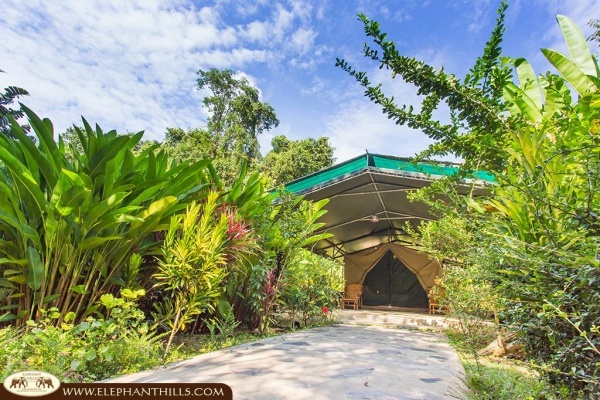 The Elephant Hills Camp has a pool from which guests can observe the green scenery around. 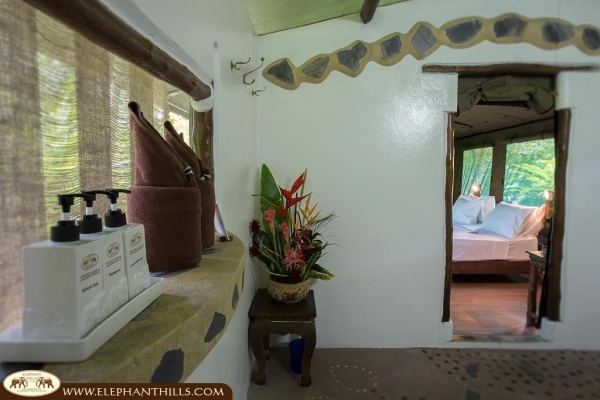 Most of the meals and the evening entertainment included in the accommodation packages take place in the Elephant Hills main camp. 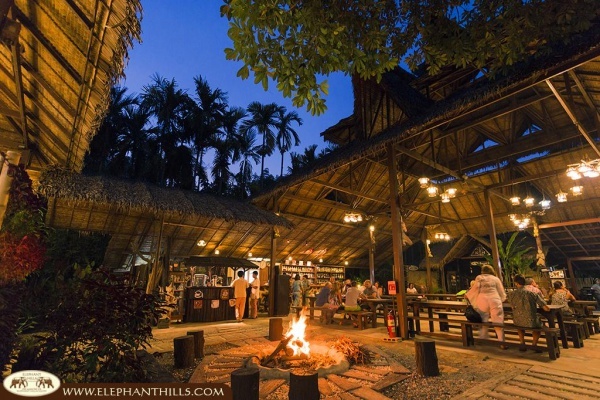 There is also the jungle explorers bar which is fully stocked with an array of wines, spirits, beers, cocktails and soft drinks to relax with and enjoy the evening performances. 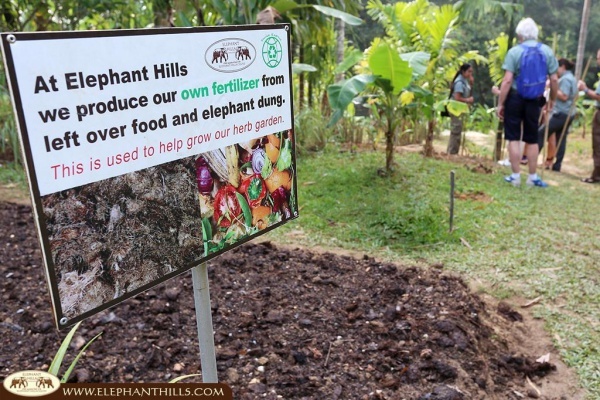 Elephant Hills offers two to four day soft adventure tours in and around Khao Sok National Park. 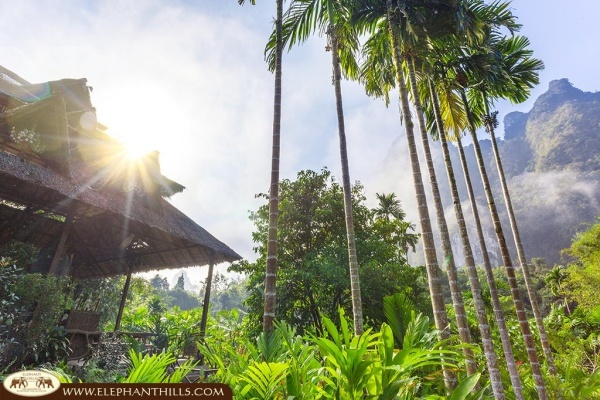 All packages are fully inclusive of accommodation, full board, activities as per chosen itinerary, an English speaking Thai tour guide as well as joint transfers to and from Elephant Hills. 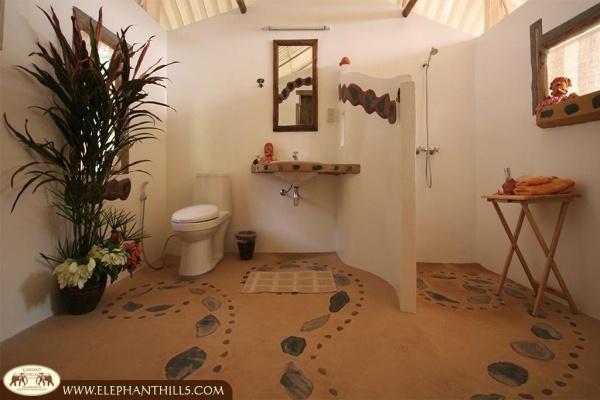 Highlight of each tour is the camp's unique Elephant Experience, during which guests will get to wash, feed and interact with the gentle giants. Besides that, guests have the option to marvel at breathtaking landscapes while lazily being paddled down a river in a canoe, explore mysterious mangrove swamps and legendary jungle lakes full of limestone formations, relax at deserted beaches, visit local markets, discover primary rainforest on foot and much more. All tours are suitable for most levels of fitness and for all ages. We recommend this camp for children starting from 4 years old.